The Lasallian welfare agency yourtown has joined forces with other support services around Australia to help in planning the federal government's Digital Mental Health Gateway Project. The planned gateway was announced late last year in response to a recommendation from the National Mental Health Commission and there are plans to progressively roll out the project starting this year. It would provide telephone and online access to help consumers better navigate mental health services using digital technology, including e-therapies and self-help resources. yourtown CEO Tracy Adams says the organisation is in a strong position to provide advice to policy-makers in this area, based on its 25 years of experience delivering the award-winning Kids Helpline. 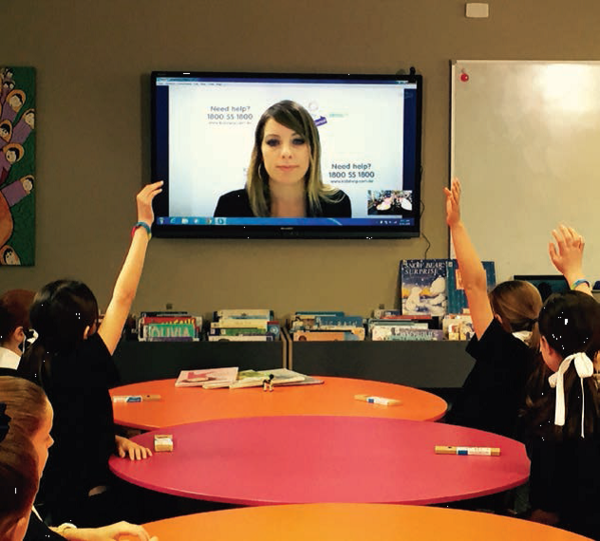 This includes highly popular web counselling services, including the classroom-based Kids Helpline@School, allowing primary students to access web-based support sessions from qualified counsellors via video link. Last year, Kids Helpline responded to more than 200,000 contacts from children and young people with over 20 percent of these contacts concerning mental health issues. "Any national service that caters for children and young people needs to ensure access to child and youth centered support and provide them with a choice as to who they reach out to for help", Tracy Adams said. "While the specifics of the Gateway project are still being formed, we're grateful that the government is welcoming our participation", she added. "We are pleased to be at the table, helping to inform decisions with data driven insights to build a better outcome for young people".